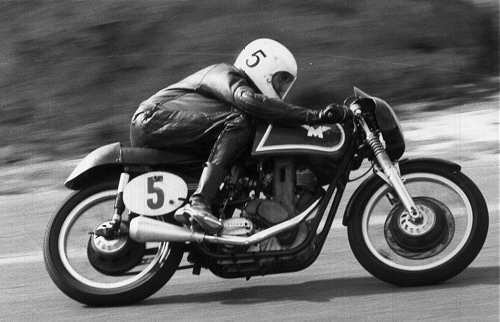 In May 1998 three rare classic racing motorcycles were stolen from Allen Burt of Sydney. Somewhere in Europe in 1958, possibly at the Isle of Man. The tank was not the original tank, but a 7R alloy tank painted red, with the AJS lettering somewhat larger than standard. The Amal 1 3/8in GP1 carburettors were fitted with SU floatbowls from a Jaguar. The top of the exhaust rocker boxes had been machined flat and a 5/16 or 1/4 inch alloy plate fitted over each rocker box. A stud, apporx 3/8 dia then passes through this plate and is secured with a lock nut. The stud goes down into the rocker box and secures the rocker posts. This mod was made on the exhaust side only. The exhaust pipes have been painted black with a heat resistant paint. The original Burman gearbox has been replaced with an A.M.C. type gearbox. An additional 1 1/4 inches of rubber padding has been inserted under the seat cover so as to give a higher riding position. Allen Burt on his 1960 G50 in more recent years. The single cylinder 500cc G50 is identical in construction to the AJS 7R except for engine capacity. The engine is fitted with a 90mm Mahle piston. The driveside crankcase is cast from aluminium and has no engine number, whereas the timeing side case is the original magnesium alloy. On the drive side behind the engine sprocket there is a circular steel plate aprox 4 inches dia with aprox 12 holes. This in place of the normal 3 hole arrangement fitted to this model. There is a "rat-trap" silencer device fitted to the megaphone. The rhs footrest is handmade of aluminium and screws directly into the swingarm spindle, about 1.5in forward of the usual location, and is secured by a locknut on the footrest shaft. The front brakedrum has a large handmade alloy cooling disc fiited. The black leather seat has a strip of white leather (rather faded and dirty) which is about 2 inches wide. This goes from the top of the hump to the lower portion of the tailpiece. The carb is the original Amal GP2, but is jetted for methanol. The floatbowl has been replaced with an SU unit from a Jaguar car. The crankpin assy was made by Charlie Ogden (a friend of Phil Irving) in Sydney. It is quite distinctive in that the pin threads into the flywheels instead of being secured by a nut on either end of the pin. It is quite likely unique. The original Lucas magneto has been replaced with a Bosch rotating magnet type. The high tension coil is fitted externally to the magneto and is mounted under the tank between two strengthening brackets behind the steering head. The machine has the original alloy tank which has been repaired on the rhs with filler and repainted in original colours. An additional 1 1/4 inches of foam has been inserted beneath the seat cover to raise the ride height. Two more images of the stolen classic racers. Six speed Schaefleitner gearbox cluster. The primary chain has been replaced with a belt drive. There is a spacer fitted behind the engine sprocket to secure the main bearing. This is the same as that fitted to the G50. It is about 4 inchs dia with approx 12 boltholes which secure the mild steel plate. The right side footrest is the same as on the other two machines. The original metal covers over the front fork springs have been removed. Aluminium fork seal holders have been made which replace the steel covers, exposing the forksprings. As on the other machines, the seat height has been increased by 30mm. The original 1 3/8 Amal GP carburettor has an SU floatbowl, as fitted to the other machines. If you have any information on the issue, you may please contact us and I will pass any relevant details on to Inspector Peter J Smith (ret), formerly of Bankstown Police. If you wish to contact him directly, I can supply his email & phone number. I am told that a well-known Australian motorcycle racer was found to be in possession of the bikes. This blog says "The two main suspects to the theft of Alan's bikes were eventually, effectively "let off"..."
The State Crime Command's Property Crime Squad specialises in busting organised stolen motor vehicle gangs. The Sun-Herald understands Strike Force Ecole's work has been focused in the Shoalhaven district south of Wollongong. "we can say that police have laid charges against two brothers from Saltwater Point, near Nowra, NSW." In April 2008, thieves stole 18 rare vintage motorcycles from Gloucestershire in the UK. The haul included a Brough 1915 ladies' model, a 1904 Humber, a Hobart 1911 & a 1926 Moto Guzzi.